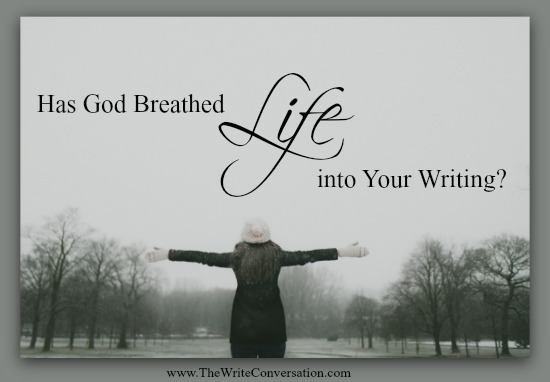 The Write Conversation: Has God Breathed Life Into Your Writing? In this year of new beginnings, many of us enthusiastically vow to put aside our fears and dream bigger, do better, and accomplish more. Our motives are pure, but statistics tell the sad news that 80% of our New Year’s resolutions fall apart by February. Schedules interfere with production. Deadlines produce panic. Life’s uncertainties pull us off course. Putting our name to our words is a big deal and we feel the pressure even after we push send. Performance anxiety runs high among writers. Especially if we forget who we’re writing for. And why. We can easily get so caught up in our projects that we no long give God reign over that to which He has called us. Our words are sacred, but only if God has breathed life into them. In the very beginning, God created the world with His Word. He spoke and matter joined together and miraculously created an incredibly beautiful world with sun and moon, sunsets, sunrises, plants, trees, rivers and seas, sea creatures, birds of the air, and beasts of the earth. Then God scooped dust from the earth and molded man, creating him in the image of Himself. Newly created man lay lifeless. And then something amazing happened. God breathed into the man’s nostrils the breath of life. The very breath of God entered into Adam and he became a living being. Wisdom, energy, and spirit surged into the man with his newly beating heart. Each time we breathe, we are breathing the breath of God, passed down from our ancestor Adam. When we yield to God’s assignments for us, our writing takes on new energy and crashes through invisible walls with power to bring life where there was none—words that allow the Holy Spirit to stir our reader’s soul and renew their minds to God’s truth. This is my prayer for each of you in this new year—that the word that God had placed in you so very long ago will be rekindled in your mind and heart. That you will see it with eyes of faith—faith that will allow the breath of God into that new thing. Words of life that have purpose and power to change the hearts of those who read your words. I pray you’ll be brave enough to lay aside that which God has for another time. Words He is not ready to breathe His life into. Words that have purpose and power but are for another time. Trust that any rejections are God’s way of guiding you into greatness, into the path of God-breathed writing. Happy New Year, dear writers. May this year bring God-breathed words that touch a hurting world and create new life. Amen Ms. Emme. Amen! Thank you for the wonderful blessing of your words this morning ma'am. May God continue to bless yours. Great post, Emme. Thanks for the reminder! God breathed life into a short story I had to get done in two weeks. I've never written better. I'll never forget the experience. It was miraculous. Thank you all for your comments. Blessings as you write God-breathed words.